– for sequences of intense fantasy action and violence throughout. It’s usually a sure thing that a movie is a bomb waiting to be dropped when its release date is not only pushed off once for several months, but for a second time to a year later. 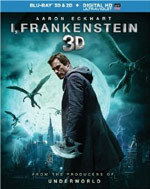 The sci-fi action film, I, Frankenstein, is based on a graphic novel by actor/writer/producer Kevin Grevioux, and was brought to the big screen with some serious acting talent to support it, helmed by rookie director Stuart Beattie. The Dark Knight and Thank You For Smoking actor Aaron Eckhart takes on the title character of Frankenstein’s monster, Adam, living in modern day. He’s pursued by a demon named Naberius, played by Bill Nighy, while caught between a war between the demons and gargoyles, lead by Miranda Otto (The Lord of the Rings) as Leonore. Naberius hopes to study how Dr. Frankenstein brought Adam to life and use that power for his own evil plans. All of this adds up to a quasi-spiritual mythology that ends up being all flair and no substance. Sophomoric direction and a poorly written script are just the start of the problems as I, Frankenstein ends up barely having enough life to get up off the operating table. While I, Frankenstein is still relatively watchable and entertaining (and doesn’t have as much wasted potential as, say, Van Helsing), the film feels like an idea and concept with potential that isn’t fully realized. It’s one of those stories and films that, in the right hands, may have turned out to be something fun and special. Instead, I, Frankenstein never rises above bargain bin quality and makes the viewer wonder what in the world any of the actors involved in the film were thinking when they signed up for this. It’s the kind of silly fantasy film that takes itself far more seriously than it has any right to, where some humor or sense of adventure could have really jolted its system. With Eckhart having previously played Two-Face/Harvey Dent skillfully in The Dark Knight, and having starred in plenty of acclaimed indie films in his career, you have to wonder what made him choose a sloppy flick like this one to headline. Similarly, while Bill Nighy isn’t always the most discerning when signing up for a role (while I enjoyed Wrath of the Titans for the most part, his role was pretty miniscule in it), you really do expect more from him. And despite having a truly great voice for a villain (Davy Jones in Pirates of the Caribbean 2 and 3 is a great example of this), not even his delivery can save some truly awful dialog he’s forced to say. To be fair, I, Frankenstein isn’t really a total loss. I’d be lying if I said I haven’t seen worse films. It’s because of the acting talent being watchable that this film is bearable. Eckhart, despite doing little more than brooding throughout the entire film, is still an appealing actor to watch and you can’t help but root for him as the underdog here. And Nighy is just a pleasure to watch. Miranda Otto, who played Eowyn in the two Lord of the Rings follow-ups, is just too good for this film and script. And Caitlin Stasey and Mahesh Jadu make a good pair as gargoyles, but the story literally dismisses them a half-hour into the film. Sadly, we get stuck with Kevin Grevioux as Dekar who seems to be in the film just because he wrote the original graphic novel used as the film’s screen story. His unusually deep voice is so distracting that it just sounds sorely out of place in the film (and unintentionally comical). He’s not a strong actor and this film does nothing but reinforce that fact. And while TV star Yvonne Strahovski (Chuck) might seem like she’d be a nice addition to the cast, playing that sterotypically unrealistically attractive scientist, she’s not given much to do and ultimately just sticks out as another out-of-place actor in the film. The story itself does have promise though; the gargoyles are ultimately angelic figures (one is even called Gideon), and serve as soldiers of God. They battle hordes of demons that intend to possess dead bodies to be reanimated to form an army to wipe out the humans, and Adam gets reluctantly caught in the middle of it. The whole demon theme, however, will be unsettling for some, so if you actually do intend to check out this film, that’s something to be careful of. It’s ultimately a battle of good versus evil presented in a very fantastical way, so I don’t think it’s something to take too seriously. I just found the spiritual aspect of the plot empty. When they began explaining the different sides, I was interested to see where this plot might go, but it ultimately proves to be pretty vapid. 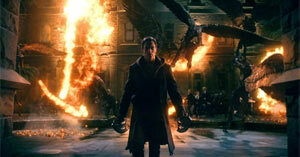 Overall, I, Frankenstein strives to be something big and significant, but it crashes and burns instead. The scope of the film is sizable, but sadly in more of a nonsensical way than anything. Things like unexplainably empty streets that should be busy and the fact that the secret world of demons and gargoyles isn’t very subtly disguised just add an air of silliness to the production. It can feel big one moment and pitifully small another. Add in a hearty dose of amateurish dialog and you have a movie that is far more flawed than it needs to be. Instead of being a fun adventure movie, I, Frankenstein is almost instantly forgettable. Creating A Monster (13:00) – The first featurette delves into the makeup design and application, character design for the film, and more about the production aspects. Blood/Gore: We see some quick closeups of Adam’s stitching with thread sticking out. We later see this again near the end of the movie; We see a dead woman lying in bed with a little bit of blood running from her mouth; Throughout the entire film, we see scarring on Adam’s face and body from when he was assembled. It may be disturbing to some viewers; We see a man’s face burn away quickly to reveal a demon; Throughout the entire film we see demons in human form (sometimes with demonic faces) being stabbed and then exploding in a fireball with bones and skeletons flying from the explosion; We see a rat in a lab with graphic stitching on its body as they try to reanimate it; A demon being interrogated has black blood dripping from his mouth. A gargoyle shoves him into holy water and he burns up; Gideon has scars on his arm; We see a body cut open on a table with the organs exposed, from a distant long shot. A demon then draws a pentagram in blood on its forehead in a closeup shot; We see Adams scarred torso when he removes his shirt. A person then stitches up a bloody wound on his back. We see a couple views of this; We see a corpse on a table with a Y-shaped bloody stitching on his chest; Naberius has three bloody cuts on his demonic, scaled abdomen from Adam slashing him; Adam has blood on his mouth; Naberius draws a pentagram in blood on Adam’s forehead (but he wipes it off); Adam makes a vertical slash up Naberius’s chest to make the symbol that would kill a demon. Violence: We see some quick close-ups of Adam’s stitching with thread sticking out. We later see this again near the end of the movie; We see a dead woman lying in bed after having been murdered; We see a man who froze to death lying dead in the snow; We see a man’s face burn away quickly to reveal a demon; We see a demon explode when a stake is driven into it with flames and bones flying through the air; Adam fights some demons attacking him and then a pair of gargoyles come to his aid and kill some of them; Adam is chained up and some gargoyles in human form hold knives to Adam’s throat; Adam leaps at a demon with a shiv to kill it; A demon snaps a human police officer’s neck. Adam then stabs and causes two demons to explode; We see a rat in a lab with graphic stitching on its body as they try to reanimate it. We then see all kinds of blue surging energy hitting its body; Naberius slaps a demon in human form in the face; Adam is chained up and collared; A horde of demons disguised as humans race to a cathedral and gargoyles fly down from it to fight them. We then see many slashing and stabbing (not gory) with both sides dying in explosions or bursts of energy (as their souls descend to Hell or rise to Heaven); A human face catches fire and turns to a demon face; We see more exploding demons; A demon being interrogated has black blood dripping from his mouth. A gargoyle shoves him into holy water and he burns up; Adam fights several more demons, stabbing and killing them; We see a body cut open on a table with the organs exposed, from a distant long shot. A demon then draws a pentagram in blood on its forehead in a closeup shot; We see hundreds of capsules hanging in a tower with dead bodies in them. We just sort of see their faces through glass panes on their helmets; Adam slaps away Naberius’s hand and jumps out a window and through a grate on the ground and onto a subway car; We see a demon’s face burn off; Adam and a demon fight with rods and throw each other around. Adam then stabs the demon and it explodes; We see Adams scarred torso when he removes his shirt. A person then stitches up a wound on his back; Gideon throws Adam around and ends up getting stabbed with his ax; Naberius strangles a man to death with his right hand (which has turned from a human hand into a demon one); Adam leaps into the air and lands a punch on a gargoyle. He jumps on one flying gargoyle and they crash into stuff before he drops down; There’s a big battle between demons and gargoyles; Adam and Naberius fight with Adam slashing Naberius’s torso a few times; Naberius draws a pentagram in blood on Adam’s forehead and the souls of demons unleash from Hell to possess the dead bodies. A firey ball of energy rushes into Adam’s eyes and mouth as he violently screams. He then wipes off the blood on his forehead and slashes Naberius, killing him; We see a large building collapse into rubble.